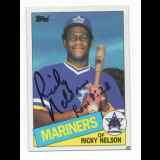 Ricky Lee Nelson is a retired Major League Baseball outfielder who played for the Seattle Mariners from 1983 to 1986. Nelson attended Arizona State University and was selected by Seattle in the 1981 amateur draft. He made his major league debut on May 17, 1983 against the California Angels. Nelson's most productive major league season came in 1983, when he registered 291 at-bats in 98 games, recording a .254 batting average. He made his final major league appearance on August 2, 1986, at the Kingdome, appearing as a pinch runner in a 7-3 Seattle victory over the California Angels. In his 123-game major league career, Nelson batted .247, with six home runs, 39 runs batted in, 38 runs scored, 79 hits, 13 doubles, 3 triples and 8 stolen bases. In 2001, Nelson managed the Oakland Athletics' entry in the Arizona Fall League to the league championship. New Response (Success): Signed both cards I sent.